© Nakakihara et al. ; Licensee Bentham Open. A CPx-ATPase (named Bxa1) is induced in the cyanobacterium Oscillatoria brevis upon exposure to multiple heavy metal ions. The function of the bxa1 gene was examined by heterologous expression in both Saccharomyces cerevisiae (yeast) and Escherichia coli. Expression of bxa1 in E. coli caused Ag, Cd and Zn tolerance, but in yeast became sensitive to those metals. To reveal the role of the N-terminal His-rich domain (first 35 amino acids) of Bxa1, we constructed E. coli and yeast transformants carrying the bxa1 (Δ35bxa1). The E. coli transformant with Δ35bxa1 was sensitive to heavy metals.On the other hand, the yeast Δ35bxa1 transformant increased heavy-metal tolerance than bxa1 transformant. 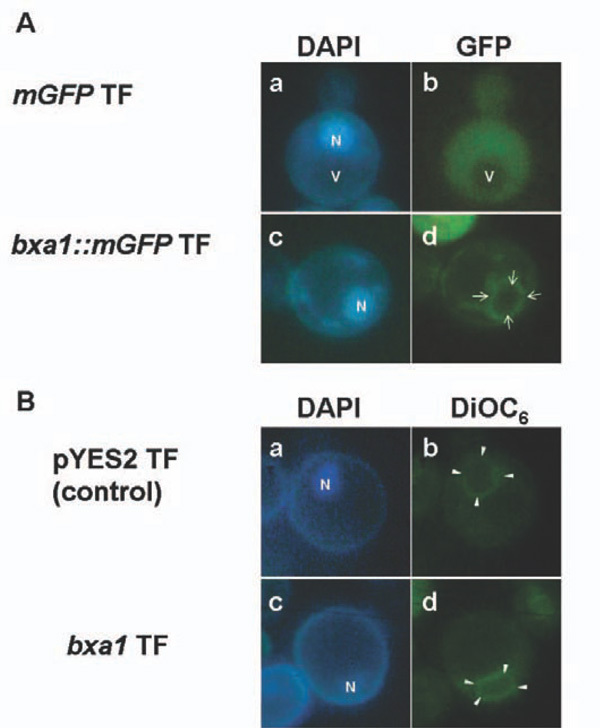 Fluorescence microscopy suggested that the two fusion proteins Bxa1::mGFP and Δ35Bxa1::mGFP are mainly localized in yeast endoplasmic reticulum (ER). These results imply that the function of Bxa1 was lost by the N-terminus deletion in both E. coli and yeast transformants. This is the first report that the His-rich domain in O. brevis Bxa1 is essential not only to monovalent (Ag+ and Cu+) but also to divalent (Cd2+ and Zn2+) heavy metal tolerance. Moreover, we clarified the toxicity mechanism against Cd using yeast transformants. Heavy metals are generally ubiquitous and persistent environmental pollutants that are introduced into the environment through anthropogenic activities. Many organisms generally utilize their own tolerance mechanisms to achieve resistance to heavy metals [1, 2], such as facilitated efflux, reduced influx, chelation (e.g., metallothionein, phytochelatin and organic acids) and partitioning (e.g., vacuole). CPx-ATPases (or P-type ATPases) have been studied and thought to act as a potential key heavy-metal transporter involved not only in metal ion homeostasis, but also in heavy metal tolerance [3, 4]. Various CPx-ATPases have been identified from prokaryotes to eukaryotes including mammals and characterized functionally [5-8]. They commonly have high specificity for heavy-metal ions, which they transport and the transported substrates depend on heavy-metal ion valence [8-11]. The CPx-ATPase gene, bxa1, was isolated from the freshwater cyanobacterium Oscillatoria brevis and it can be induced at almost the same level by both monovalent (Cu+ and Ag+) and divalent (Zn2+ and Cd2+) heavy metal ions . However, the function of this protein for these stresses still remains unknown. Many CPx-ATPases contain a highly conserved characteristic cysteine-rich (CXXC)n domain in the polar amino-terminal region and this domain can be replaced by a histidine (His)-containing motif . The Bxa1 N-terminus includes two adjoining Cys residues and His-rich (11 His) motif. This domain has been suggested to be involved in metal binding , but the exact role of the His-rich domain has not been investigated. Heterologous expression in yeast is a convenient system and has been well used for characterization of the role of the heavy metal transporters derived from a variety of organisms. The Escherichia coli ZntA can confer Cd and Pb resistance to yeast and Arabidopsis thaliana by an efflux of these ions to outside . Both CPx-ATPases derived from A. thaliana and a heavy metal hyperaccumulator, Thalaspi caerulescense, can also confer heavy metal tolerance to yeast [15, 16]. In this study, we used the heterologous expression in both E. coli and yeast to characterize of the role of Bxa1. Our results suggested that the deleted Bxa1 lost its function by the deletion of the His-rich domain. This is the first report that the N-terminal His-rich domain of O. brevis Bxa1 is responsible for tolerance not only to monovalent (Ag/Cu) but also to divalent (Cd/Zn) heavy metals. Furthermore, we clarified the toxicity mechanism against Cd using the yeast transformant. Saccharomyces cerevisiae wild-type strain, BY4742 (MATα, his3Δ1, leu2Δ0, lys2Δ0, ura3Δ0) was provided by Euroscarf (Frankfurt, Germany). A synthetic medium, Yeast Nitrogen Base (YNB) (Q-BIOgene Inc., US) medium supplemented with 2% glucose and 0.05 g/l amino acids (His, Leu and Lys) and 0.1 g/l uracil were used for preculture of yeast cells at 30°C. YNB medium was used with additional 1.94% (w/v) galactose and 0.06% (w/v) glucose for induction during the heavy metal sensitivity test on solid media (1.5% agar in YNB medium). For fluorescence microscopy, 2% galactose and 2% raffinose were used as carbon sources to induce the gene-expression of bxa1 and its deletion series in yeast. In the other experiments, 2% glucose was used as a carbon source. E. coli strain Top10 and two vectors, pCR®2.1 and pBAD/Myc-His B, were purchased from Invitrogen (US). Luria-Bertani (LB) media and LB agar plates (1.5 % agar in LB media) were used for cultivation of E. coli at 37°C. In agar plate tests using yeast transformants, YNB medium containing various concentrations of heavy metals, AgNO3 (0, 0.2, 0.4 and 0.6 µM), CuSO4 (0, 0.5, 1 and 1.25 mM), CdCl2 (0, 1, 10, 20 and 30 µM) and ZnCl2 (0, 5, 7.5, 10 and 15 mM) were solidified with 1.5% agar. Log-phase cells were diluted with YNB medium to OD600 1.0 and then spotted on the YNB agar plates. In sensitivity tests using E. coli transformants, log-phase cells were inoculated to an LB medium including 0.008% L-arabinose and then cultured for 4 h at 37°C to induce the bxa1 genes. After adjustment of initial cell densities, cells were spotted on YNB (adjusted to pH 6.5) agar plates containing various concentrations of AgNO3 (0, 1.0 and 2.25 µM), CdCl2 (0, 0.75 and 1.0 mM) and ZnSO4 (0, 1.5 and 2.5 mM). Sensitivity to heavy metals was estimated by the colony-forming ability on the agar plates after 4 d of incubation at 37°C for yeast and after 2 d of incubation at 37°C for E. coli, respectively. The open reading frame (ORF) of bxa1 was amplified by PCR using O. brevis genomic DNA as a template. Two nucleotides, Bxa1-ORF5’ BamHI: cacaggatccaggcataagccaaaacccaga and Bxa1-ORF3’ XhoI: cacactcgagattgcccgccctcctg, were used as gene specific primers in this reaction. The resulting product was subcloned into the pCR®2.1 vector and sequenced to confirm its DNA sequence. This plasmid was digested with BamHI and XhoI to create each restriction site in the 5’ end and 3’ end of bxa1 ORF, allowing the subsequent cloning of the full length of the ORF into a yeast expression vector, pYES2 (Invitrogen, US). The resulting plasmid was designated pEN108 (Fig. 1A). As pYES2 carries the GAL1 promoter, the expression level of the inserted gene in the downstream region of this promoter can be induced by galactose in the YNB medium. Construction of the bxa1::mGFP fusion genes. (A) to (D) represent starting, intermediates and end-product in the construction of mGFP fusion plasmids. 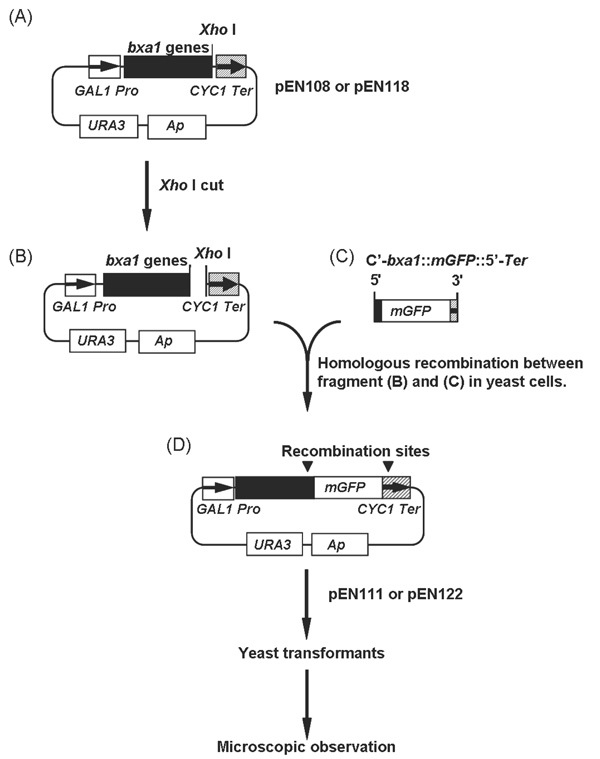 Plasmid pEN111 and pEN122 were used for localization analyses in yeast cells. Heavy-metal sensitivity tests of the constructed yeast transformants. Three transformants, pYES2 transformant (control), bxa1 transformant and Δ35bxa1 transformant, were grown in YNB. Ag sensitivity test (A), Cu sensitivity test (B), Cd sensitivity test (C) and Zn sensitivity test (D). Log-phase cells of these strains were adjusted to OD600 1.0, serially diluted (1/20, 1/100, 1/500, 1/2500) and then spotted on YNB agar plates containing various concentrations of heavy metals. Plates were incubated at 30°C for 4 d.
Heavy metal sensitivity tests of the constructed E. coli transformants. Three transformants, pBAD/ Myc-HisB transformant (control), bxa1 transformant and Δ35bxa1 transformant, were grown in YNB + L-arabinose. Ag sensitivity test (A), Cd sensitivity test (B) and Zn sensitivity test (C). Log-phase cells of these strains were adjusted to OD600 1.0, serially diluted (1/20, 1/100, 1/500, 1/2500) and then spotted on YNB agar plates containing various concentrations of heavy metals. Plates were incubated at 37°C for 2 d.
Localization of Bxa1::mGFP fusion protein in yeast transformants. (A) Green fluorescent image derived from Bxa1::mGFP are shown by arrows in d. Nucleus [N] in yeast cells were visualized by DAPI staining in a and c. Vacuole [V] was detected as a dark area without any fluorescent signal in a and b. (B) Double staining of pYES2 transformant (control strain) and bxa1 transformant by DiOC6 and DAPI. Green fluorescent image derived from DiOC6 is indicated by white arrow heads in b and d. Nucleus [N] in yeast cells were visualized by DAPI staining in a and c.
Microscopic observation of Cd treated yeast cells using SEM (A) and TEM (B). a and c: pYES2 transformant. b and d: the bxa1 transformant. a and b: without Cd treatment. c and d: with 100 µM Cd treatment for 5 h. White bar: 1 µm length. A truncated version of bxa1 gene (Δ35bxa1), with the first 35 amino acids from the N-terminal region deleted, was also cloned into the pYES2 vector using as forward primer Δ35Bxa1-ORF5’ BamHI: cacaggatccatgggcaacggagattttaacctca. The reaction was conducted using the reverse primer Bxa1-ORF3’ XhoI. A plasmid carrying Δ35bxa1 designated pEN118 was generated. To confirm the localization of Bxa1 in yeast transformant cells, we constructed BY4742 carrying fusion genes, bxa1::mGFP (modified Green Fluorescent Protein) and Δ35bxa1::mGFP (Fig. 1). The mGFP gene was a yeast-specific GFP and kindly supplied from Dr. E. Delhaize (CSIRO, Australia). Plasmid pEN108 and pEN118 (Fig. 1A) was digested with XhoI at 37°C for 3h (Fig. 1B). Using Bxa1-GFP-F: ggggtggctttagcagctattttcaatgcaactagagttttaaagatgagaggagaagaacttttcactgg as a forward primer and pYES2Ter-R: gggagggcgtgaatgtaag cgtgacataactaattacatgatttatttgtatagttcatccatgcca as a reverse primer, mGFP was amplified by PCR from the mGFP DNA fragment to attach homologous recombination sequences to the both end of the mGFP (Fig. 1C). The sequence in bold was derived from the 3’ terminal region of the bxa1 and the underlined sequence came from mGFP. The italic characters were derived from the 5’-terminator region of the CYC1 transcription terminator in pYES2. PCR was performed for 30 cycles (denaturing at 94°C for 60 s, annealing at 55°C for 60 s and extension at 72°C for 120 s). The linearized plasmid (pEN108 or pEN118) digested with XhoI (Fig. 1B) and the PCR product (C'-bxa1::mGFP::5'-Ter) (Fig. 1C) were mixed together and then introduced into BY4742 to cause a homologous recombination between the common region of the two fragments in vivo. The generated plasmids (Fig. 1D) were designated pEN111 (bxa1::mGFP) and pEN122 (Δ35bxa1::mGFP), respectively. Yeast cells carrying these plasmids were monitored for the localization of the fusion proteins. The E. coli transformant carrying bxa1 or Δ35bxa1 were also constructed. ORF of bxa1 was amplified by PCR using pEN108 as a template and Bxa1-ORF3’ XbaI: cacatctagaaactttaaaactctagttgcattgaaaatagct as a common reverse primer. Two nucleotide primers, Bxa1-ORF5’ XhoI: cacactcgagcatgcaaaaagccaaatcgagc and Δ35Bxa1-ORF5’XhoI: cacactcgagccggcaacggagattttaacct were used as forward primers in this PCR. After double digestion with XhoI and XbaI, each DNA fragment was inserted into pBAD/ Myc-His B. Generated plasmids carrying bxa1 and Δ35bxa1 were sequenced and then designated pEN127 and pEN129, respectively. Log-phase cells grown in YNB medium at 30 °C were centrifuged, suspended in fresh YNB medium including a final concentration of 10 µM Cd and then incubated at 30 °C for 3 h (Cd influx period). The Cd-treated cells were spun down and washed with 10 mM EDTA once and with deionized water twice to remove unabsorbed Cd from the cell surface. The washed cells were furthermore suspended in fresh YNB medium without Cd and then grown at 30 °C for another 3 h (Cd efflux period). During the cultivation, cells were harvested every 3 h (0, 3 and 6 h), then washed with 10 mM EDTA once and with deionized water twice. The cell density of each sample was adjusted to 0.75 by OD600 value. Cd-treated cell samples were subsequently decomposed by the treatment with HNO3 at120 °C for 15 min and the Cd content was determined using a polarized Zeeman atomic absorption spectrophotometer Z-9000 (Hitachi, Ltd., Japan). Yeast transformant carrying pEN111 or pEN122 was used for fluorescence microscopy. Over-night culture of yeast transformants were transferred to fresh YNB medium, including 2% galactose and 2% raffinose as the final concentrations, and grown for 8 h to induce expression of mGFP fusion genes. Staining by 3, 3’-dihexyloxacarbocyanine iodide (DiOC6, Molecular Probes, US), an indicator of the yeast ER membrane, was performed according to Poster and Dean . Nuclei-specific staining was carried out using 4', 6-diamidino-2-phenylindole dihydrochloride (DAPI, Dojindo Laboratories, Japan). Observations were performed using a fluorescence microscope, BH-2 RFCA (Olympus, Japan) with appropriate filters. Fluorescence images were captured using a digital camera (FinePix S2Pro, Fujifilm, Japan). These yeast transformants were also used for both transmission electron microscopy (TEM) by H7100 (Hitachi, Ltd., Japan) and scanning electron microscopy (SEM) by Quanta 400 (FEI Company, US) to observe internal properties and morphological properties of yeast cells, respectively. Glutaraldehyde/permanganate fixation for TEM and glutaraldehyde/osmium oxide fixation for SEM were carried out according to Wright  with modification. Experimental values were expressed as mean ± SE in this study. The mean values of statistical significance were performed by one-way analysis of variance. Post hoc comparison of individual experimental groups was done using the Tukey-Kramer multiple comparison test. To analyze the role of O. brevisbxa1 in heavy-metal toxicity in eukaryotes in detail, we constructed a yeast transformant carrying bxa1 and used it for the heavy metal sensitivity test. The bxa1 transformant showed a slight growth inhibition under conditions without heavy metals. Moreover, the bxa1 transformant was sensitive to all tested heavy metals compared to the control transformants (Fig. 2). It also seemed that there is a difference in sensitivity of the bxa1 cells among the tested heavy metals. To test whether the observed growth inhibition in yeast was actually associated with the expressed bxa1, we obtained spontaneous ura- segregated cells from the ura+transformant (BY4742 carrying the bxa1) by cultivation in YNB medium supplemented with uracil. Consequently, the ura- segregated cells, which lost pEN108, recovered the heavy metal sensitivity similar to the parental cells (BY4742) (data not shown). These results strongly suggested that the observed phenotypes in the bxa1 transformant were bxa1 dependent. To compare the heavy metal sensitivity between yeast and E. coli, we constructed two E. coli transformants carrying pEN127 or pBAD/Myc-His B. The E. coli transformant carrying bxa1 was more tolerant to heavy metals (Ag, Cd and Zn) than the control transformant (Fig. 3). 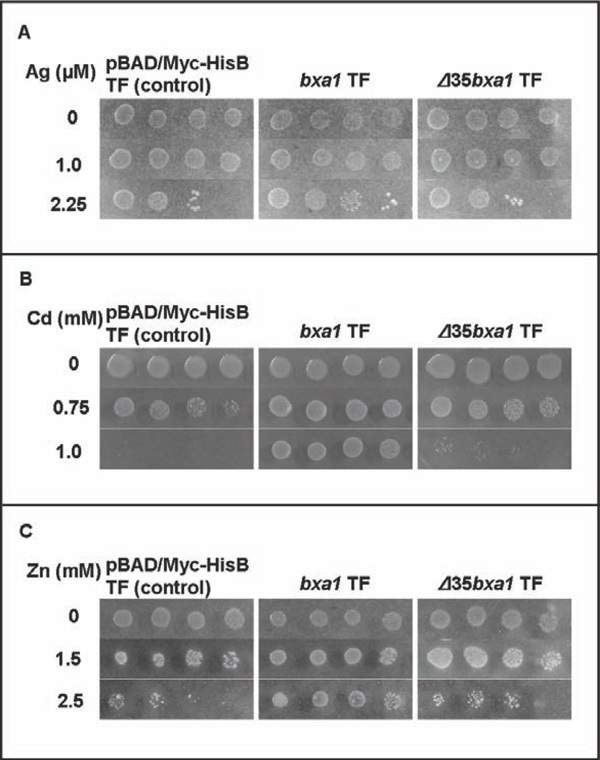 These results clearly indicated that expression of bxa1 conferred heavy metal tolerance (Ag, Cd and Zn) to E. coli cells. As E. coli cells generally have CopA, as a Cu efflux transporter , the Cu sensitivity test using the E. coli transformant was not performed. To investigate the function of the N-terminal region of Bxa1 protein, we constructed transformants of yeast and Ecoli carrying Δ35bxa1. Expression of Δ35bxa1 in yeast did not affect the growth in a heavy metal-free condition (Fig. 2). Sensitivity to the tested heavy metals was ameliorated by deletion of the bxa1 gene. Thus, all transformants showed heavy metal tolerance as follows; pYES2 transformant > Δ35bxa1 transformant > bxa1 transformant. These results suggested that deletion of the N-terminal of Bxa1 caused a loss of the function of this gene. Segregation of Δ35bxa1 plasmid from the yeast transformant was also performed, and the segregants showed phenotypes similar to their patent cells. The E. coli transformants carrying Δ35bxa1 was also applied to the heavy metal test (Ag, Cd and Zn) (Fig. 3). The Δ35bxa1 transformantrevealeda heavy-metal tolerance level similar to the control transformant carrying pBAD/Myc-HisB. These results indicated that the N-terminal domain of Bxa1 is essential to the tolerance phenotype for Ag, Cd and Zn in E. coli. Why did the bxa1 show different heavy metal sensitivity in yeast and E. coli? To address this question, we determined the localization of Bxa1 in yeast cells (Fig. 4A). pEN111 carrying the bxa1::mGFP and the control plasmid carrying mGFP were introduced into BY4742. By fluorescent microscopic observation, we detected most of the fluorescent signal derived from mGFP homogenously in the cytoplasm of the control transformants (8 h, BY4742 carrying mGFP) (Fig. 4A b). Compared with the control transformants, the fluorescent signal derived from the bxa1::mGFP transformants was mainly detected as a ring (Fig. 4A d). The light-blue DAPI fluorescent signal showing the nuclear region was detected in the center of the ring within the same cell carrying the bxa1::mGFP (Fig. 4A c). Δ35Bxa1::mGFP fusion protein also showed localization similar to Bxa1::mGFP as a ring (data not shown). These results indicated that deletion of the N-terminal domain did not change the localization of the truncated protein in yeast cells. The localization of our Bxa1 in yeast cells was confirmed by double staining of yeast cells using DAPI and DiOC6 (Fig. 4B). The fluorescent signal derived from DiOC6 showing a ring similar to Bxa1::mGFP was detected surrounding the nuclei in the two transformants (Fig. 4B b and d). These results suggested that Bxa1 is localized in the ER region. To clarify the toxic mechanism by Bxa1 in yeast cells, the Cd content in the three transformants during both Cd uptake and release were determined (Table 1). There was no significant difference in Cd influx among the tested transformants. Compared with the end of the Cd uptake period, the control and transformant carrying Δ35bxa1 showed 51.7 and 55.5% decrease of relative Cd content at the end of the release period, respectively. The relative Cd content was decreased 16.4% in the transformants carrying bxa1 under the same condition. These results implied that the N-terminal region of Bxa1 is related to the transport activity of Cd. Cd content were measured from three independent experiments and shown as the mean ±SE. a Cd content after 10 􀀁M Cd treatment for 3 h as a uptake period. b Cd content after non Cd treatment for 3 h as a release period. c Relative Cd content (%) was calculated from the formula shown above. a Exponentially growing cells were treated with or without 100 µM Cd for 5 h (-Cd or +Cd). b More than 100 cells in each treatment were observed and shown as the mean ± S.E. c cAsterisks (**) indicate statistical significance vs. the non-treated pYES2 transformant at P <0.01. Our results suggested the possibility that some critical changes in the metabolism occurred by expression of Bxa1 in the ER region in the Cd-treated transformants. To elucidate this possibility, we observed the Cd-treated yeast transformants (100 µM Cd treatment for 5 h at 30°) by SEM (Fig. 5A). Compared with BY4742 carrying pYES2, the transformant expressing bxa1 exhibited a spherical shape (L/W ratio of pYES2 transformant and bxa1 transformant are 1.3 and 1.1, respectively) and smaller cell size (Table 2). pYES2 and bxa1 transformants under Cd treatment relatively increased approximately 1.2 and 1.4 times larger in cell area than their respective non-treated condition (Fig. 5A). To establish whether expression of the bxa1 specifically affects the ultrastructure of the yeast transformant, we performed TEM observation using the three yeast transformants grown under a 100 µM Cd condition for 5 h (Fig. 5B, photo data for Δ35bxa1 were not shown). There was no clear difference in ultrastructure within the cells among the three tested transformants under the Cd-free condition. In the control cells, 6.4% of the untreated cells had fragmented vacuoles and this number increased to 11.3% (1.8 times) by Cd treatment. Our two bxa1 transformants showed fragmentation in the range of 10.6-14.8% and 32.5-41.6% in the absence and presence of Cd treatment, respectively. These results indicated that Cd treatment causes severer fragmentation of the vacuole in the bxa1 transformants (approximately 2.8 to 3.1 times) than in control cells. The E. coli transformant carrying the full length of bxa1 can show clear tolerance to Ag, Cd and Zn. On the contrary, expression of bxa1 caused sensitivity to heavy metals in the yeast transformant. These results suggested that Bxa1 plays a role in heavy metal toxicity. Heterologous expression of CPx-ATPase derived from cyanobacterial transporter in yeast cell is the first report, to our knowledge. We also constructed and characterized E. coli and yeast transformants carrying the Δ35bxa1. Consequently, sensitivity to the tested heavy metals was changed in both E. coli and yeasttransformants. E. coli Δ35bxa1 transformants became sensitive to the tested three heavy metals than the bxa1 transformant (Fig. 3). 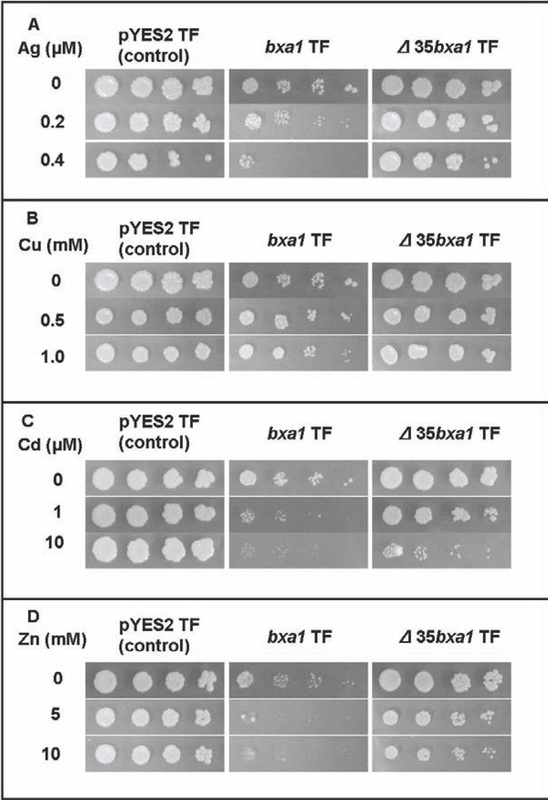 In yeast, the Δ35bxa1 transformant was more tolerant to the tested heavy metals (Ag, Cu, Cd and Zn) than the bxa1 transformant (Fig. 2). Our influx/efflux experiments in yeast transformants indicate that the His-rich domain is important for heavy metal tolerance (Table 1). Taken together, our yeast and E. coli transformant experiments indicate that the N-terminal His-rich domain in Bxa1 is involved in heavy metal tolerance. Arguello  described that the His-containing motifs in CPx-ATPases are heavy-metal binding regions. However, their roles were limited to either monovalent or divalent heavy metal ions as transport substrates. We revealed that the N-terminal double Cys motif following the His-rich (11 His) motif of O. brevis Bxa1 is essential to tolerance against both monovalent and divalent heavy metal ions. The yeast transformant carrying the bxa1 causes a partial growth inhibition under without heavy metals (Fig. 2). A transportation and accumulation of trace metals to ER may occur even under untreated condition, because our yeast media includes Cu and Zn as essential trace element. DiOC6 is a unique dye for yeast ER membrane staining . However, green fluorescent signals derived from DiOC6 and mGFP in one cell cannot be discriminated using a microscopic detection system. To detect the ER localization within the yeast cell, we performed double staining using DAPI and DiOC6 in this study. The green fluorescent signal derived from DiOC6 was also detected as a ring surrounding the nucleus like Bxa1::mGFP (Fig. 4). Our results strongly suggested that the Bxa1::mGFP mainly localized in ER. Localization of Δ35Bxa1::mGFP implies that the first 35 amino acids in the N-terminal of Bxa1 are not a determinant for the localization of this protein in the yeast cell. Tong et al. reported that Bxa1 localizes in cell membrane in E. coli cell  and Δ35Bxa1 may also localize in cell membrane. In case of E. coli transformant carrying the bxa1, localization of Bxa1 transporter in cell membrane can properly function for heavy metal tolerance. We suppose that the heavy-metal sensitive phenotype observed in yeast bxa1 transformants is due to the localization of Bxa1 in ER. ER is considered to be sensitive to Cd2+ in both fission and budding yeasts [10, 20]. Bxa1 localized in ER probably promotes an accumulation of heavy metals in ER by its transport activity and causes a disturbance of protein synthesis. In this study, we also found that Cd toxicity leads to two physiological features in our yeast transformants. First, Cd treatment causes cell expansion (Fig. 5A and Table 2). Similar cell expansion by Cd treatment has also been observed in both Dunaliella salina and Chlamydomonas bullosa . No answer has been obtained whether cell expansion is a toxic or a resistant mechanism against Cd in microorganisms. 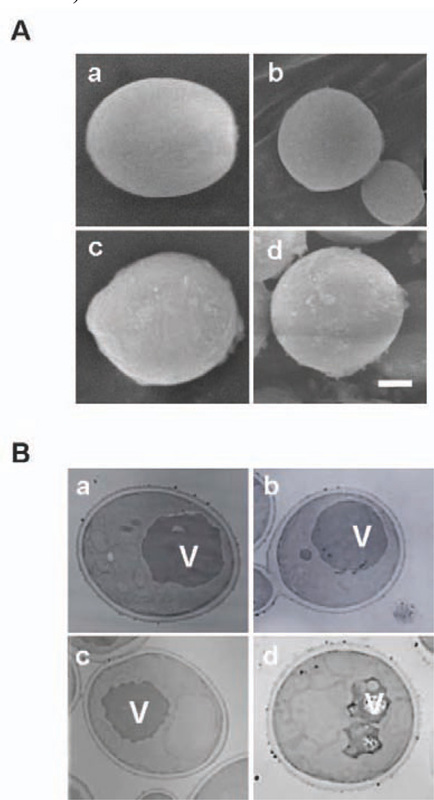 Second, Cd treatment also leads to fragmentation of the vacuole in yeast cells (Fig. 5B). Compared with the non-treated condition, vacuole fragmentation is increased by Cd treatment in both the control and a series of bxa1 transformants with different frequencies. Vacuole fragmentation is also induced upon exposure to lipid peroxides originating from the peroxidation of ω-6-polyunsaturated fatty acids, and Ni2+ [22, 23]. We revealed that Cd treatment leads to the vacuole fragmentation in yeast. We thank the Norwegian Institute for Water Research for providing O. brevis. We also thank Dr. Ashraf Metwally, Dr. Kazunobu Hirose and Dr. Kader MD Abdul for their valuable comments. This work received financial support from JSPS Joint Project under the Japan-Korea Cooperative Science Program (to B.E. ), JSPS Joint Project under the Japan- India Cooperative Science Program (to B.E. ), Special Educational Study on “Crop Improvement by Gene Analyses” (to B.E. ), Grant-in-Aid for Scientific Research from the Ministry of Education, Culture, Sports, Science, and Technology of Japan (No. 19580066 to B.E. and No. 19510068 to S.N.) and Oohara Foundation for Agriculture Sciences (to B.E.). Hall JL. Cellular mechanisms for heavy metal detoxification and tolerance J Exp Bot 2002; 53: 1-11. Eide DJ. Zinc transporters and the cellular trafficking of zinc Biochim Biophys Acta 2006; 1763: 711-22. Williams LE, Pittman JK, Hall JL. Emerging mechanisms for heavy metal transport in plant Biochim Biophys Acta 2000; 1465: 104-26. Clemens S. Molecular mechanisms of plant metal tolerance and homeostasis Planta 2001; 212: 475-86. Bull PC, Cox DW. Wilson disease and Menkes disease: new handles on heavy-metal transport Trends Genet 1994; 10: 246-52. Fu D, Beeler TJ, Dunn TM. Sequence, mapping and disruption of CCC2, a gene that cross-complements the Ca2+-sensitive phenotype of csg1 mutants and encodes a P-type ATPase belonging to the Cu2+-ATPase subfamily Yeast 1995; 11: 283-92. Rensing C, Mitra B, Rosen BP. The zntA gene of Escherichia coli encodes a Zn(II)-translocating P-type ATPase Proc Natl Acad Sci USA 1997; 94: 14326-31. Bernard C, Roosens N, Czernic P, Lebrun M, Verbruggen N. A novel CPx-ATPase from the cadmium hyperaccumulator Thlaspi caerulescens FEBS Lett 2004; 569: 140-8. Solioz M, Odermatt A. Copper and silver transport by CopB-ATPase in membrane vesicles of Enterococcus hirae J Biol Chem 1995; 270: 9217-21. Clemens S, Bloss T, Vess C, Neumann D, Nies DH, Zur Nieden U. A transporter in the endoplasmic reticulum of Schizosaccharomyces pombe cells mediates zinc storage and differentially affects transition metal tolerance J Biol Chem 2002; 277: 18215-21. Seigneurin-Berny D, Gravot A, Auroy P, et al. HMA1, a new Cu-ATPase of the chloroplast envelope, is essential for growth under adverse light conditions J Biol Chem 2006; 281: 2882-92. Tong L, Nakashima S, Shibasaka M, Katsuhara M, Kasamo K. A novel histidine-rich CPx-ATPase from the filamentous cyanobacterium Oscillatoria brevis related to multiple-heavy-metal cotolerance J Bacteriol 2002; 184: 5027-35. Arguello JM. Identification of ion-selectivity determinants in heavy metal transport P1B-type ATPases J Membr Biol 2003; 195: 93-108. Lee J, Bae H, Jeong J, et al. Functional expression of a bacterial heavy metal transporter in Arabidopsis enhances resistance to and decreases uptake of heavy metals Plant Physiol 2003; 133: 589-96. Gravot A, Lieutaud A, Verret F, Auroy P, Vavasseur A, Richaud P. AtHMA3, a plant P1B-ATPase, functions as a Cd/Pb transporter in yeast FEBS Lett 2004; 561: 22-8. Papoyan A, Kochian LV. Identification of Thalaspi caerulescens genes that may be involved in heavy metal hyperaccumulation and tolerance Characterization of a novel heavy metal transporting ATPase Plant Physiol 2004; 136: 3814-23. Poster JB, Dean N. The yeast vrg4 gene is required for normal golgi functions and a new family of related genes J Biol Chem 1996; 271: 3837-45. Wright R. Transmission electron microscopy of yeast Microsc Res Tech 2000; 51: 496-510. Rensing C, Fan B, Sharma R, Mitra B, Rosen BP. CopA: An Escherichia coli Cu(I)-translocating P-type ATPase Proc Natl Acad Sci USA 2000; 97: 652-. Wu C-C, Bal N, Perard J, et al. A cloned prokaryotic Cd2+ P-type ATPase increases yeast sensitivity to Cd2+ Biochem Biophys Res Commun 2004; 324: 1034-40. Visviki I, Rachlin JW. Acute and chronic exposure of Dunaliella salina and Chlamydomonas bullosa to copper and cadmium: effects on ultrastructure Arch Environ Contam Toxicol 1994; 26: 154-62. Wonisch W, Zellnig G, Kohlwein SD, et al. Ultrastructural analysis of HNE-treated Saccharomyces cerevisiae cells reveals fragmenta-tion of the vacuole and an accumulation of lipids in the cytosol Cell Biochem Funct 2001; 19: 59-64. Tuszynska S. Ni2+ induces changes in the morphology of vacuoles, mitochondria and microtubules in Paxillus involutus cells New Phytol 2006; 169: 819-28.